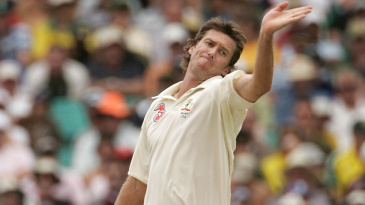 Glenn McGrath has been appointed director of the MRF Pace Foundation in Chennai, replacing Dennis Lillee, who has held the post since its inception in 1987. McGrath, currently in India, has called it a "great honour." "I know it won't be possible to replace someone like Dennis Lillee," McGrath said. "His legacy will be hard to live up to, but I will try my best in my role as the director at the foundation. "The academy's contribution to world cricket is immense. I have trained there under Lillee and have experienced the facilities on offer." The foundation has played a role in shaping the careers of several of the world's best fast bowlers, including Brett Lee and Zaheer Khan. Lillee, who spent 25 years with the organisation, hoped the foundation would continue its good work under McGrath's leadership. "McGrath is the perfect choice to carry the vision of the Foundation forward," Lillee said. "I am happy for him and wish him all the best in his new role. I am certain that the MRF Pace Foundation will produce many more international fast bowlers under his guidance." Lillee expressed satisfaction with the results of his association with the foundation and said that the decision to leave was not easy. "It has been a long journey. We had to begin from scratch, building facilities and slowly developing into a world-class academy. Our efforts and hard work have paid off and it pleases me to see bowlers trained at the foundation leading the Indian attack."